Surfing competitions on the island of Oahu are spread throughout the year, from October to April on the North Shore and from May to September in the southern part of Oahu. 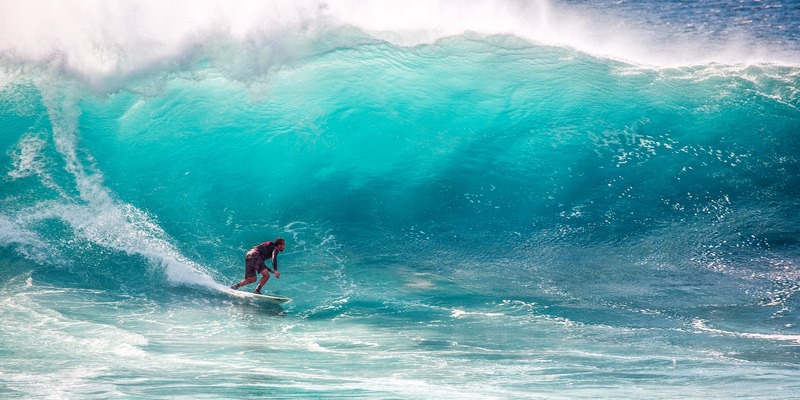 Check out our List of Surf Competitions in Hawaii below! DanielsHawaii offers North Shore Tours! If you are interested in the BIG WAVES on the North Shore of Oahu – Do not visit Hawaii in the summer. During summer there are almost NO WAVES on the North Shore of Oahu. Therefore there are no Surf Competitions in the summer on the North Shore. It’s still beautiful… just no big waves and no Surf Competitions. Our North Shore Tour passes by Sunset Beach, Waimea Bay and Laniakea. Just like our Best Spots Oahu Tour we stop at our Turtle Beach, Laniakea. Laniakea is also a good surf spot and one of the few surf spots where the North Shore of Oahu has waves almost all year long. How do you know if there is a Surf Competition on the North Shore? Surfing competitions in Hawaii usually have a so-called “holding time” which means whether the competition takes place on this particular day or not. It always depends on the weather conditions. Normally, it will be announced at 7 am in the morning whether the surfing competition will take place this day. To make it easier for you we have a list of the most famous Surf Competitions in Hawaii for you. One of the most famous big wave surf competition, The Eddie only takes place when the conditions are perfect. If you like to see Videos of The Eddie, including surfing accidents at Waimea Bay on the North Shore, just visit our Hawaii YouTube Channel. Here is a Video of the worlds famous Surf Competition – The Eddie Aikau. Friends of Ali’i Beach Menehune Surf Contest Surf Haleiwa Ali’i Beach Park ? Rell Sunn Menehune Surf Contest Surf Makaha ? If you should have more questions about surfing in Hawaii, we are more than happy to help you on our Facebook page!